-The state you are likely to wake up with and how it might color your day. -Blind spots that keep you ‘asleep’ although you have been experimenting with your strategy and authority. - Deeply seated beliefs and behaviors. During this program you will be asked to keep a dream log journal and record your dreams. ~ How best to prepare for sleep according to your type. ~ What shifts take place in your design when you go to sleep. ~ The weak point for you when transitioning from sleep to waking state in the morning, and how it might color your thoughts, feelings and behavior. ~ Your archetypal dreamscape and repetitive dreaming themes. ~ The transits and how they might affect your dreaming life. ~ Your dreaming persona infiltrating your waking life. I have always been a big dreamer. In fact, my dreaming life used to be my favorite escape when real life was too dull and embittering. In my dreams I often met special people with meaningful messages which were communicated through striking visual symbols. I felt secretly special. For years I believed that my dreaming life was a precious reflection of a transcendent dimension that was more real and more important than my mundane life. Well I was almost right. 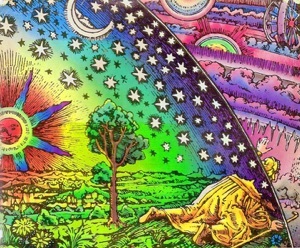 The dreaming dimension is a reflection of a transcendent realm - only it is the deepest programming of the maya at work. We are all helplessly vulnerable in our sleep state. Depending on your Dream Rave design you may wake up in the mornings feeling ‘far away’ like me - or deeply disturbed by your dream experience and perhaps even feeling stressed and fearful. You may or may not remember your dreams, whatever the case for you the result is the same - you are programmed to wake up as a person that is not you and into a life that is not yours. Would you like to dream with me?